Climate alarmists put forth scary scenarios saying that carbon dioxide induced global warming is causing unprecedented and accelerating sea level rise which will drown our coastal cities and wipe out South Pacific Islands, but observational evidence shows there is no reason for alarm. Let’s start with the big picture. 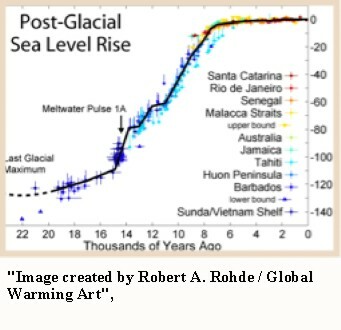 Since the end of the last glacial epoch, global sea level has risen 120 meters (393 feet), about one meter per century. Most of that was the result of melting of continental ice sheets between 18,000 and 8,000 years ago. The rate of sea level rise has leveled off to about 1- to 3 millimeters per year, about the thickness of two pennies. Larsen and Clark (2006) studied the rate of sea level rise for the past 6,000 years, based on geologic evidence and the historic record. The researchers found that there has been no acceleration of sea level rise in response to increased temperature or CO2 levels. Satellite measurement of the rate of sea level rise is reported at 3.2±0.4 mm/yr versus Holgate’s value of 1.45 mm/yr. It just so happens that satellite measurement started at the bottom of a cycle, thereby giving a false impression of the overall rate of rise. Because the rate of sea level rise is cyclical, it is easy to cherry-pick time intervals to suit an agenda. Holgate does not address possible causes of the rate cycle. However, Kolker and Hameed (2007), report “a major fraction of the variability and the trend in mean sea level at key sites along the Atlantic Ocean are driven by shifts in the position and intensity of the major atmospheric pressure centers that reside over the Atlantic Ocean, the Azores High and the Icelandic Low,” which they refer to as atmospheric centers of action. Apparent sea level is also affected by variability of storms, winds, floods, waves, shifts in major ocean currents, volcanically-induced ocean heat content variations, the El Niño Southern Oscillation, subsidence, uplift, tectonics, and freshwater fluxes. 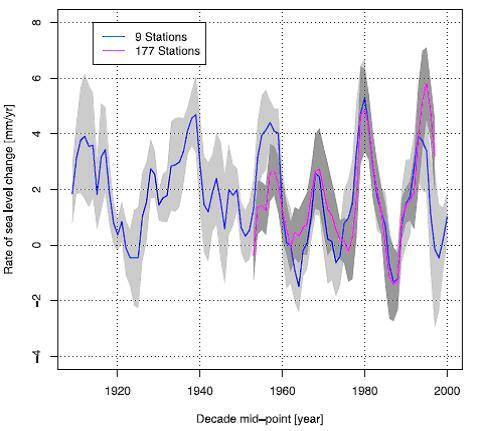 Houston and Dean (2011) analyzed the records of 57 U.S. tidal gauges for the period 1930 to 2010. They found “almost a balance with 30 gauge records showing deceleration and 27 showing acceleration, clustering around 0.0 mm/y. The mean is a slight deceleration of -0.0014 mm/yr. In other words, the slow rise of 1- to 2 mm per year in global sea level is an artifact of our current interglacial period. Local sea level rise or fall depends on local geology, the amount of groundwater pumping in coastal areas, and the cyclic weather patterns. It has nothing to do with carbon dioxide emissions. Larsen, C.E. and Clark, I. 2006. A search for scale in sea-level studies. Journal of Coastal Research 22: 788-800. Scafetta, N., 2013, Multi-scale dynamical analysis (MSDA) of sea level records versus PDO, AMO, and NAO indexes, Climate Dynamics, DOI 10.1007/s00382-013-1771-3. See the full paper here. By buckling of the tectonic plates; it appears that some places the sea is rising / other places falling. Earth has enough water, to cover ALL the land by 2km of water. Therefore: we should be grateful that the plates are buckling – otherwise, by erosion, would be all under water. ‘Scientific” evidences that Greenland melted and was 8m extra water in the sea – is completely WRONG! Yes, the sea was higher, because: Gibraltar Straights didn’t exist – man created big desert in Sahara; just by rubbing two sticks – evaporation increased and Mediterranean sea was a swamp – including Adriatic, Aegean – because Caspian and Black sea became further away from the sea, they dried also, including Aral. because those inland waters didn’t have tributaries. NOW because of Gibraltar opened; those seas contain more water than water trapped in Greenland’s ice.